Looking for adorable, reasonably priced baby clothes? Then check out MyBabyClothesBoutique.com! This site is a great source for unique clothes with personality. 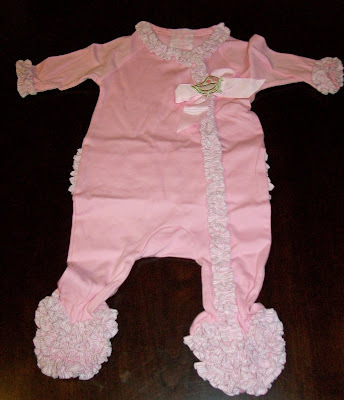 They have great gifts for the youngsters in your life: from Baby hats and Baby headbands to Tutus to Baby Socks - MyBabyClothes Boutique has them all! I was recently sent the little chick ruffled sleeper to review for my baby niece and I couldn't be happier with it! It is absolutely adorable and made of super soft cotton. I love the precious little ruffles and the sweet little bird detail. The sleeper is really nice - it feels like it is made of quality material and will hold up to multiple washings. Verdict: My Baby Clothes Boutique has a lot of really sweet outfits and accessories, many under $25! Their site is easy to navigate and has a wide range of unique gifts - many of which can be personalized! *Promo only valid from 11/29/2010 12am – 12 am est. Cannot be combined with other offers. Shipping not included. 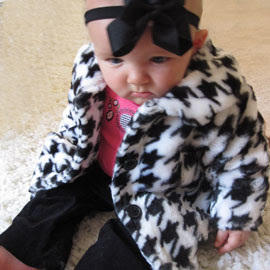 Win it: One lucky Frugal & Fabulous reader will win a $25 gift certificate to MyBabyClothesBoutique.com! 4. Add my button or link to your blog/site! 5. Follow @lindsfrugalfab on Twitter! You have until Monday, December 6 @ 7pm EST to enter! (Winner must respond within 48 hours.) Giveaway open to U.S. residents only. OMG, those ornament bloomers, too sweet! I subscribe to your feed through Google reader. Thanks! I'd get the Turquoise Tutu Set. Thanks. I am a facebook fan of Frugal and Fabulous. Thanks! I subscribe to your blog via google reader! Love this site! Thanks so much for sharing. I had never heard of them before. My favorite part is that many of the adorable outfits aer unique. 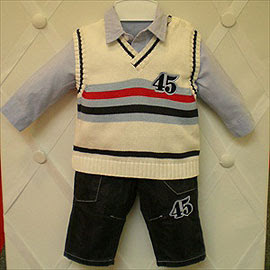 I love the Henley Romper Tangerine Argyle - perfect for a preppy little boy! I am expecting my first, a boy, in January and cannot wait! I'd love to buy some cute girlie outfits for a friend of mine who is expecting. 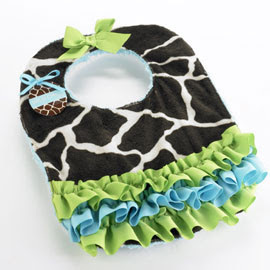 I like the Giraffe Footed Sleeper. I love the little girls bloomers. You can even personalize them. The boys santa shirt and cordouroy pants. Very cute stuff. Wow! Those are the cutest baby clothes ever! 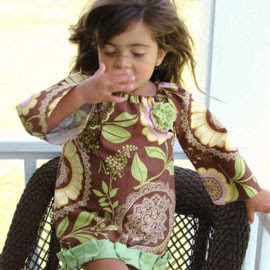 I like Brown Lotus Print Cheri Dress the best though. So cute! I'd buy the Baby Baseball Three Piece Layette for a great gift. Thanks for the giveaway! I would probably go with the Football Three Piece Set for my baby grandson. Thank you for the chance to win.